Tensions Escalate Between Turkey And Germany : Parallels Turkey and Germany have been close allies — around 3 million Turks live in Germany. But in recent months a rift has developed, and it's complicated by Turkey's ongoing purge following a failed coup. 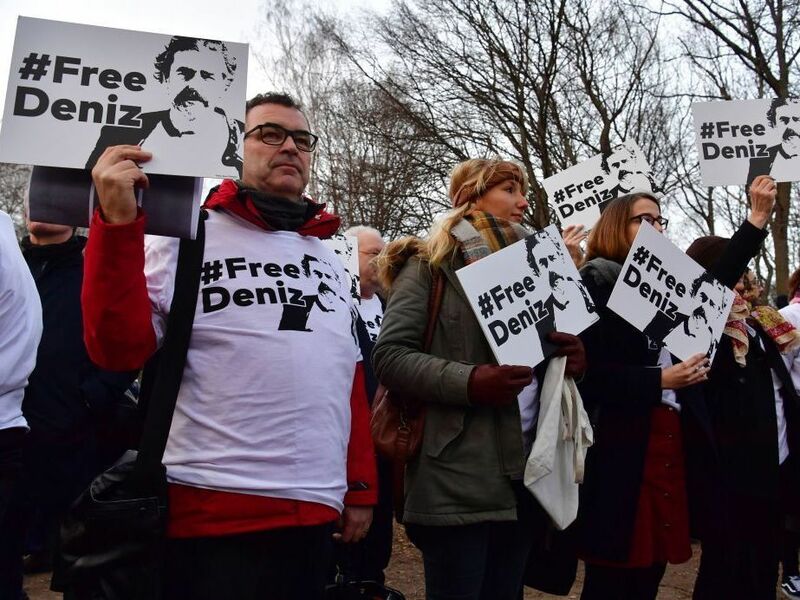 People hold placards with hashtag #FREEDENIZ to protest the detention of German journalist Deniz Yucel in front of Turkish embassy in Berlin on Feb. 28, 2017. At a sidewalk cafe in Istanbul, Dilek Mayaturk Yucel fiddles with her wedding ring as she reminisces about her marriage ceremony back in April. "We were really so happy. We each read a poem we'd written by ourselves," Mayaturk Yucel recalls. "I think we spent 45 minutes together." Then guards escorted the groom away. The Yucels' wedding took place during visitation hours at a Turkish prison where the groom, Deniz Yucel, has been held since February. "When we got married, it was the first time I'd seen Deniz in 43 days. During that period, I never heard his voice, never got any message from him," Mayaturk Yucel says. "He's alone, in isolation. But he's such a strong person. He knows he didn't do anything other than his job." Yucel is the Turkey correspondent for a big German newspaper, Die Welt, and a dual citizen. He's not the only German citizen arrested in Istanbul recently. Last month, during a workshop for humanitarian workers at an Istanbul hotel, police burst in and arrested six people. Those hauled away included the local head of Amnesty International, Idil Eser, a Turkish citizen, and Peter Steudtner, a German citizen and freelance aid worker. "Suddenly, the police came in and said, 'Stop! Where is Peter? Peter Steudtner? Hands up, don't move,'" says Steudtner's lawyer, Deha Boduroglu. "There is absolutely no evidence for this detention." Steudtner and Yucel are among dozens of foreigners arrested in Turkey in recent months, accused of aiding terrorists. More than 50,000 Turks have been detained in this broad crackdown as well, in the wake of a failed coup attempt last summer. Turkey is under a state of emergency. The government says such arrests are necessary to rid society of the coup plotters and their sympathizers. But rights groups say President Recep Tayyip Erdoğan is taking advantage of the crisis to eliminate his opponents and crack down on a free press and human rights activism. A trial is underway, in a specially built court near the capital Ankara, of nearly 500 defendants accused of plotting to overthrow the government in last year's coup. But Boduroglu says his client's fate is an international matter. "I hope it will be resolved through the Turkish courts, but probably it will go through the diplomatic level," he says. Germany and Turkey have long been allies. Germany sends the most foreign tourists to Turkey. Some 3 million Turks live in Germany — the biggest Turkish diaspora in the world. This spat began when Germany wouldn't allow Erdogan's supporters to hold political rallies there. In turn, Turkey blocked German lawmakers from visiting their troops at an anti-ISIS mission on a Turkish base — though this week Turkey said it may let them visit another base next month. With these arrests of Germans, Berlin has warned its citizens to exercise caution when traveling to Turkey — prompting Erdogan to hit back. "I want to remind my German friends, and the rest of the world: You will not be able to denigrate Turkey," the Turkish president said in a speech in late July. "You do not have the power to scare us." Erdogan accuses Germany of sheltering Turks from the purge that has followed last year's failed coup. Hundreds of Turks have applied for asylum in Germany since then. "We are at a low point" in Turkish-German relations, says Sinan Ülgen, chairman of the Istanbul-based Center for Economics and Foreign Policy Studies (EDAM), and a visiting scholar at Carnegie Europe in Brussels. But the feud serves a political purpose for Erdogan at home, he says. "I think the political calculus has been to consolidate the nationalist vote by adopting this strident tone towards Turkey's partners in the West," Ülgen says. But he says it may backfire. Opinion polls show more Germans oppose Turkey joining the European Union than ever before. Germany has threatened to cut off some economic ties with Turkey. In a classroom at the Istanbul branch of the Goethe Institute, a German cultural center, Turks are busy studying the German language. It's the second foreign language taught in Turkey, behind English. "For German companies, it's not a must but it's much better if you learn German," says Necibe Cakici, an electrical engineer at the local Mercedes factory. She says she hopes this feud with her country's biggest trading partner will blow over. "I think Mercedes will not close my factory in Turkey," Cakici says. "But for further investments, it could cause problems I think." For now, she says she'll stay enrolled in her German class. She's still hoping German language skills will help her get a promotion at the Mercedes factory.